Famers Market, 1827 W. 95th St. Original Pancake House, 10437 S. Western Ave.
All business association members are invited to attend monthly Board Meetings on the fourth Tuesday of the month at 8 am. at the Original Pancake House, 10437 South Western Avenue. These meetings are an excellent opportunity for business owners and managers to share experiences and collaborate with one another. (Please note: there are no Board Meetings in August or December.) View meeting agenda. 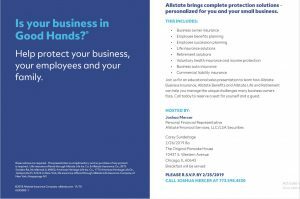 Is your business in Good Hands?